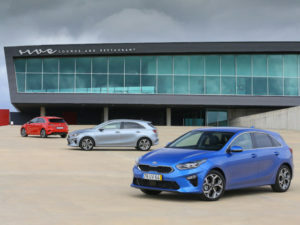 Kia has revealed pricing for the new third-generation Ceed, which goes on sale on 1 August introducing new engine and driver assistance technologies. Priced from £18,295 for the hatch compared to £15,370 for the current model and also still offered in Sportswagon guise, the new model, now known simply as Ceed, occupies a similar on-road footprint to its predecessor, but brings increased boot space – including for the Sportswagon – as well as greater shoulder room for rear passengers, more headroom in the front row, and a lower driving position. Engine line-up will include a revised version of the Ceed’s 1.6-litre ‘U3’ diesel engine, which brings emissions from 99g/km (NEDC Correlated) in the 114bhp six-speed manual variant fitted with the Eco Pack, rising to 101g/km without the pack and 105g/km with a dual-clutch transmission. There’s also a 134bhp variant, which offers emissions from 104g/km with the Eco pack (106g/km without) for manual models, and 109g/km with the dual-clutch auto. Petrol options include an updated 118bhp 1.0-litre T-GDi engine with emissions from 122g/km with the Eco Pack (125g/km without), as well as a new 138bhp ‘Kappa’ 1.4-litre T-GDi, which replaces the earlier 1.6-litre GDI, and offers emissions of 125g/km with seven-speed dual-clutch auto or 128g/km in manual guise with the Eco Pack (130g/km without). Additionally, a 98bhp 1.4-litre MPi engine will also be available (142g/km). Engines will also get mild hybrid technology from 2019 to cut emissions further. The Ceed will also become the first Kia to offer ‘level two autonomous driving’ Lane Following Assist technology, which tracks vehicles in front and detects road markings to keep the car in its lane on the motorway, at speeds from 0 to 81mph. Additional available technologies include Smart Cruise Control with Stop & Go, Blind Spot Collision Warning, Rear Cross-Traffic Collision Warning, Smart Parking Assist, and pedestrian recognition with haptic steering wheel warnings for the Forward Collision-Avoidance Assist system. Four trim lines will be available from launch – grade ‘2’, ‘Blue Edition’, grade ‘3’ and ‘First Edition’. Full UK pricing and specification will be announced in due course.